POLYVINYL CHLORIDE (PVC) All Statements herein are expressions of opinion, which by performance and testing are believed to be accurate and reliable, but are presented without guarantee or responsibility on our part. Statements concerning possible use of our products are made without any knowledge that such recommended uses may infringe any patent. No warranty, expressed or implied, is made or intended. This specification has been developed only as a guideline and not meant as an authority of exactitude. 1. SCOPE OF WORK The work covered by these specifications consists of installing a polyvinyl chloride (PVC) geomembrane, in the areas shown on the project drawings. All work shall be done in strict accordance with the project drawings, these specifications and the fabricator’s approved panel layout. Sufficient material shall be furnished to cover all areas as shown on the drawings including seam areas, anchor trenches and appurtenances as required. The fabricator and the installer of the liner shall allow for any anticipated or planned shrinkage or wrinkles in the field panels, installing the membrane free of stress or tension. geomembrane on a minimum of ten projects. The installer shall be certified by the fabricator to install fabricated products. 4. SUBMITTALS The fabricator shall furnish a proposed geomembrane panel layout to be approved in writing by the owner’s representative prior to material shipment. The drawings will show: the direction of factory seams, the size of panels and the location of field seams, consistent with the requirements of the project drawing. These details shall include the recommended termination details of the geomembrane. 5. FACTORY SEAMS The PVC roll stock shall be factory fabricated into the largest panels possible to minimize field seams. Field fabrication will not be allowed. Prior to factory seaming, all roll goods shall be inspected. All factory seams shall be made by radio frequency (RF) welding methods. All factory seams shall have a minimum width of 1 inch. The surface of the welded areas must be dry and clean. Pressure must be applied to the full width of the seam on the top and bottom surface while welded area is in a melt-type condition. 6. INSPECTION AND TESTING OF FACTORY SEAMS All panels and seams shall be 100% visually inspected during fabrication. No defective seams will be allowed. Upon discovery of any defective seam, production shall stop and the seam shall be repaired. Production personell shall determine and rectify the cause of the defect prior to continuation of the seaming process. In addition to visual inspection, a 48-inch weld sample shall be made with each factory seam welding unit used in this work at the beginning of every work shift and every four hours of production thereafter. Sample shall be taken from a seam specifically made for quality testing and not taken from the fabricated panel itself. Test specimens shall be cut at quarter points from each 48-inch seam sample (a total of three places) and tested for seam strength and peel adhesion. The shear and peel seam strength shall be tested in accordance with ASTM D882. A log shall be maintained showing the date, time, panel number and test results. Failure of the material and/or seams to meet all the requirements of these specifications may be cause for rejection of the material and/or seams as appropriate. Test results shall be provided to the owner’s representative upon request. 7. CERTIFICATION AND TEST REPORTS Prior to installation of the panels, the fabricator shall provide the owner’s representative with written certification that the factory seams were inspected in accordance with Section 6. 8. PANEL PACKAGING AND STORAGE Each factory-fabricated panel shall be accordion-folded and placed onto a sturdy wooden pallet designed to be moved by a forklift or similar equipment. Each panel shall be given prominent and unique identifying markings indicating the proper direction of unfolding to facilitate layout and position in the field. The panels shall be suitably packaged, enclosed and protected to prevent damage during shipment and each package shall be prominently marked in the same fashion as the panels within. Until needed, packaged factory fabricated panels shall be stored in their original unopened wrapping, and protected from the direct heat of the sun, where possible. Pallets should not be stacked. 9. SUBGRADE PREPARATION The surfaces on which the lining is to be placed shall be maintained in a firm, clean, dry and smooth condition during the lining installation. All surfaces shall be compacted and smooth graded with anchor trenches provided as required and detailed. All surfaces to be lined shall be free of rocks, roots, gravel, grade strakes or debris that may puncture the geomembrane. The subgrade shall be compacted to a minimum of 95% of the dry density (as determined by ASTM D398 Standard Proctor Method). Geotextiles may be used as a cushioning agent. All vegetation, if present, shall be removed and if required by the owner’s representative, a soil sterilant applied. The soil sterilant shall be selected for the geographical area and native grasses and growth. All subgrade damaged by construction equipment and deemed unsuitable for geomembrane deployment shall be repaired prior to placement of the geomembrane. If groundwater is present within 12 inches below the surface to be lined, the general contractor shall dewater the area prior to and during installation of the liner. If the liner is to be installed at an elevation below the current or possible future ground water elevation, an adequate underdrain system shall be installed to prevent ground water pressure from developing beneath the geomembrane. Excessive ground water can force the geomembrane upward through the cover soil and any liquid contained in the impoundment. Immediately prior to the installation of the geomembrane, the owner’s representative and the geomembrane installer shall perform a complete and detailed inspection to determine acceptance of the finished subgrade and elevations. Any erosion or other damage to the subgrade that has occurred shall be corrected before geomembrane placement. 10. GEOMEMBRANE PLACEMENT PVC geomembrane shall not be deployed until all applicable submittals and certifications listed in Sections 4 and 7 of this specification are submitted and approved by the owner’s representative. Should the PVC geomembrane be deployed prior to approval of the owner’s representative, it will be at the sole risk of the geomembrane installer and/or general contractor. If the material does not meet the specification it shall be removed from the site at no cost to the owner. Only those panels of lining material that can be anchored and seamed together the same day shall be unpackaged and placed into position. In areas where high wind is prevalent, the lining installation should begin on the upwind side of the project and proceed downwind. The leading edge of the liner shall be secured at all times with sandbags sufficient to hold it down during high winds. The leading edges of the liner material left exposed after the day’s work shall be anchored with sand bags spaced no less than 10 feet to prevent damage or displacement due to wind. The geomembrane shall be placed over the prepared surfaces in such a manner as to insure minimum handling and in accordance with the approved shop drawings. The lining shall be sealed to all concrete structures and other openings in accordance with details shown on the plans and shop drawings. The geomembrane shall be closely fitted and sealed around all inlets, outlets and other projections through the lining, using prefabricated pipe boots as shown in the construction details. Liner panels, damaged from any cause, shall be repaired in accordance with Section 14 of this specification. Geomembrane placement shall not be performed if moisture present prevents proper subgrade preparation, panel placement or panel seaming. The geomembrane shall not be allowed to “bridgeover” voids or low areas in the subgrade. In these areas the PVC geomembrane shall be installed with sufficient slack as to allow material to remain in intimate contact with the subgrade or the subgrade repaired. In general, field seams shall be oriented parallel to the line of the maximum slope, i.e., the seam should run down the slope. In corners and odd geometric locations, the total length of the field seam shall be minimized. If at all possible, seams shall not be located at low points in the subgrade unless geometry requires seaming to be done at these locations. No vehicles will be allowed on the geomembrane. Small rubber tired equipment with a ground pressure not exceeding 5 psi and a total weight not exceeding 750 lbs will normally be allowed. Typical equipment that is usually used during installation and testing and allowed on the geomembrane include air compressors, generators, etc. Materials, equipment or other items shall not be dragged across the geomembrane surface or be allowed to slide down slopes on the lining. All parties walking or working on the liner shall wear soft-sole shoes. No smoking shall be permitted on the liner. 11. FIELD SEAMS Solvent adhesive, a capable hot air welder or a wedge welder shall be used to seal the factory-fabricated panels together in the field. These seams shall be made as a lap joint formed by lapping the edges of the sheets in accordance with the following recommendations or as specified by welder manufacturer. Panel Overlapping for Seams: Chemical Seam: 6” to 8” overlap with a 2” wide seam. Thermal Seams: 4” to 6” overlap and a minimum 1.5” wide seam. Avoid fishmouths, wrinkles, folds or pleats in the same area. Where fishmouths do occur, they should be slit out far enough from the seam to dissipate them, lapped, seamed together in the lapped area and patched. Any necessary repairs to the PVC geomembrane shall be done using an additional piece of the specified parent material applied as stated in Section 14 of this specification. All patching material shall have rounded edges. 12. INSPECTION AND TESTING OF FIELD SEAMS The owner’s representative shall be notified prior to all pre-qualification and production welding and testing. A. Prequalification Test Seams: 1. Test seams shall be prepared and tested by the geomembrane installer to verify that the seaming parameters are adequate. Test seams shall be made in accordance with ASTM D 4437 by each welding technician at the beginning of each seaming period. Test seaming shall be conducted under the same conditions and with the same equipment and operator as production seaming. The test seams shall be approximately 5 feet long for all types of field welds. 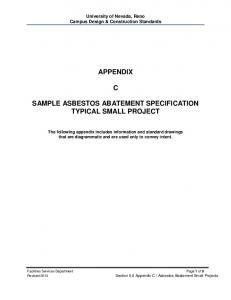 Samples shall be tested and evaluated in accordance with the specifications in Section 2. It should be noted that conditioning of samples and appropriate temperature and humidity requirements must be met to allow for proper testing of the PVC geomembrane. If there is no area on site to provide for these requirements, the trial weld samples can be sent to an independent laboratory to verify seam strength. For peel and shear testing, see Destructive Field Seam Testing Section 12(C) of this document. Field peel and shear strength values should meet the requirements of PGI-1104. If a test seam fails, an additional test seam shall be immediately completed. If the additional test seam fails, the seaming apparatus shall be rejected and not used until the deficiencies are corrected and a successful full test seam can be produced. Each test seam shall be labeled with date, geomembrane temperature, number of seaming unit, panel identification, seam number or test location, technician performing the test seam and a pass or fail description and be stored by the installer for future reference. B. Non-Destructive Field Seam Testing 1. The installer shall non-destructively test the full length of all field seams before the seams are covered. Each seam shall be numbered or otherwise designated. The location, date, test unit, name of QC person, and outcome of all non-destructive shall be recorded and submitted to the owner’s representative. Testing should be performed as the seaming progresses, not at the completion of all field seaming, unless agreed to in advance by the owner’s representative. All defects found should be repaired, re-tested and remarked to indicate acceptable completion of repair. Non-destructive testing shall be performed using the air lance test method (ASTM D4437). Chemical and solid thermal, i.e., single track, welds can be tested utilizing the Air Lance Test Method ASTM D4437. The installer shall provide an air compressor, air hose and air lance wand with a pressure gauge capable of measuring the air flow at the tip. Experienced technicians familiar with this procedure shall perform the testing. This non-destructive test involves placing the air lance wand ¼” to ½”, but not more than 2”, from the edge of the completed seam and closely monitoring the backside of the sheet for any air penetration through the seam, loose edges, riffles, and/or noise. If air penetrates the seam area, the technician will either see this visibly or hear it audibly. All seams tested by the air lance method shall be marked with the date tested, name of the technician, length of the seam, and test results. As with all QC work this should be documented on all QC paperwork and preferably witnessed by the owner’s representative. Vacuum Box testing is usually not used on PVC geomembranes because the geomembrane can be pulled up into the vacuum box unless a screen covers the box opening. The vacuum box test procedure is described in ASTM D4437. C. Destructive Field Seam Testing 1. When air lance testing is performed using ASTM 04437, a minimum of one destructive sample per 500 lineal feet of field seam or at another pre-determined length should be obtained and tested in accordance with ASTM 06392 by the geomembrane installer from a location specified by the owner’s representative. To obtain test results prior to completion of geomembrane installation, the geomembrane installer shall cut destructive samples as seaming progresses. The owner’s representative will direct where the samples are cut. The geomembrane installer shall not be informed in advance of the sample location. When air channel testing is performed, no destructive samples will be taken from the production liner but destructive samples can be obtained from the anchor trench or test welds. All field samples shall be marked with their sample number and seam number. The sample number, date, time, location, and seam number shall be recorded. The geomembrane installer shall repair all holes in the geomembrane resulting from obtaining the samples. All patches shall be repaired and tested using an air lance test. All destructive seam areas shall be patched and tested the same day as the destructive sample. owner’s representative for laboratory testing and one section given to the geomembrane installer for field testing. 4. For field testing of destructive samples, the geomembrane installer shall cut 10 identical 1” wide replicate specimens from his sample. The geomembrane installer shall test 5 replicate specimens for seam shear strength and 5 for peel strength. Peel strength tests will be performed on both the inside and outside of dual track welds. To be acceptable, an average of five specimens must pass field seam specification testing requirements shown in Section 2. If independent seam testing is required by the specifications, it shall be conducted in accordance with ASTM 06214 for chemical seams and ASTM 06392 for thermal seams by an accredited independant laboratory. Reports of the results of examinations and testing shall be prepared and submitted to the owner’s representative. For field seams, if laboratory tests fail, that shall be considered an indicator of possible inadequacy of the entire seam length corresponding to the test sample. Additional destructive samples of the subject seam shall be taken by the geomembrane installer at locations indicated by the owner’s representative, typically 10 feet on either side of the failed sample and laboratory seam tests shall be performed. Passing tests shall be an indicator of adequate seams. Failing tests shall be an indicator of inadequate seams. All destructive sample locations shall be repaired with a cap strip either thermally or chemically welded into place. All cap stripped seams shall be non-destructively tested with an air lance test. D. Identification of Defects 1. The geomembrane installer and owner’s representative shall inspect panels and seams during and after panel deployment to identify all defects, including holes, blisters, and undispersed raw materials. The geomembrane installer and owner’s representative shall inspect seams before, during, and after field seaming to identify all dirty and wrinkled areas and any defects. E. Evaluation of Defects: Each suspect location (both in seam and non-seam areas) shall be non-destructively tested using the air lance test method in ASTM 04437. Each location which fails non-destructive testing shall be marked, numbered, measured and posted on the daily installation drawings and subsequently repaired. 1. If a destructive sample fails the field or laboratory tests, the geomembrane installer shall repair the seam between the two nearest passed locations on both sides of the failed destructive sample location. Defective seams, tears, or holes shall be repaired by re-seaming or applying a cap strip. Re-seaming may consist of either: a. Removing the defective area and rewelding the parent material using the original welding equipment, or b. Reseaming by cap stripping as described in Section 14. Each patch shall extend a minimum of 6” in all directions beyond the defect. All repairs shall be measured, located and recorded. F. Verification of repairs on seams: Each repair shall be non-destructively tested using the air lance test in ASTM 04437. Tests which pass the non-destructive test shall be taken as an indication of a successful repair. Failed tests shall be re-seamed and retested until a passing test result is obtained. The number date, location, technician, and test outcome of each patch shall be recorded. 13. PIPES AND STRUCTURE PENETRATION SEALING SYSTEM Penetrations shall be sealed using the same PVC geomembrane material, prefabricated boots, and accessories as shown on the project drawings. The prefabricated or field fabricated assembly shall be field welded to the main PVC geomembrane as shown on the project drawings so as to prevent leakage. These areas can be welded with any of the methods listed in Section 11. All sealed areas shall be air lance tested using ASTM D4437 and verified to be leak free. 14. REPAIRS Any repairs made to the liner shall be made with parent material supplied by AccuGeo Liner. For the best welding performance, the repair should be made with newly manufactured material. Patches shall be cut with rounded corners and shall extend a minimum of 6” in each direction from the damaged area. The entire surface of the patch shall be bonded to the PVC lining material. 15. WARRANTY The geomembrane manufacturer shall confirm in writing, that the furnished material to will be free of defects in materials and workmanship at the time of sale, and against deterioration due to normal weathering in a buried state on a pro-rata basis for up to 20 years from the date of completed installation. Report "SAMPLE PROJECT SPECIFICATION POLYVINYL CHLORIDE (PVC) For"